The time to tackle climate change is now. With continued inaction and indifference at the state and federal level, Rights & Democracy is calling on Vermonters to embrace Energy Democracy. Nationally, the federal government has withdrawn from the Paris Climate Agreement and is making deep cuts to the Environmental Protection Agency as well as the Department of Energy. But, here in Vermont we aren’t seeing the kind of bold response that its people have come to expect. On the same day that Pres. Donald Trump (sic) withdrew from the Paris accord, Gov. Phil Scott appointed an anti-wind (and anti-solar farm) attorney as Chairman of the powerful Vermont Public Service Board —the quasi-judicial panel that regulates the state’s utilities and oversees energy development. If that wasn’t enough, on the day when 5000 people gathered on the State Capitol lawn to call for action to combat climate change, Gov. Phil Scott was nowhere to be seen. In fact, he was driving his race car. Clearly, taking action against climate change and ensuring that working Vermonters are not left behind in the renewable economy is NOT his top priority. We need to change Scott’s mind. Being a follower is not the Vermont way. For years, Vermont has been a national leader in renewable energy, and often served as an environmental conscience for the nation. But, we cannot rest on our laurels at a time when our leaders are refusing to take action. It’s time for communities around Vermont to come together and chart a path forward. Enter the idea of Energy Democracy. Rights & Democracy envisions a new energy system that disrupts the status quo of how we produce, own, and use energy by putting the power in the hands of the people. Vermont would benefit from a system that does not allow our natural energy resources to be financially strip mined for the benefit of distant communities and distant owners. We need to keep that power, and those profits, here at home to benefit all Vermonters. An energy independent Vermont would meet our goal of generating 90 percent of our energy from renewable sources by 2050 while also providing clean jobs and clean power in communities throughout the state, and a healthier environment for all Vermonters. 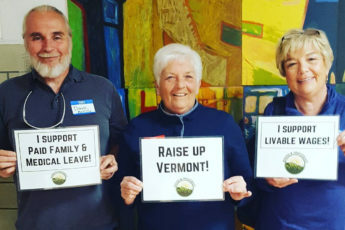 Sign on and support these principles of Energy Democracy and send a message to the Vermont Public Service Board, the Department of Public Service, state legislators, utility executives, and Gov. Phil Scott that Vermont’s energy policies need to put the future of Vermont’s power in the hands of the people. With the US withdrawing from the Paris Agreement, it’s time for states and communities around the country to take swift, bold action and provide the necessary leadership to ensure a just transition from fossil fuels to a renewable future. Vermont can, and must, be a national leader in this effort. Guarantee that no family has to spend more than 5% of their income paying for energy. Sign our petition below and let us know if you’d like to volunteer on our Energy Democracy campaign.